"To young Jenny, the house on Mary Street was home -- the place where she was loved, a blue-sky world of Barbies, Bewitched, and the Beatles. Even her mother's pain from her mysterious illness could be patted away with powder and a kiss on the cheek. But when everything that Jenny had come to rely on begins to crumble, an odyssey of loss, loneliness, and a child's will to survive takes flight...."
The genre of misery lit has pervaded Western book stores for at least the past ten or fifteen years, with some bookshops even having whole sections dedicated to the genre. The term coined by The Bookseller magazine refers chiefly to autobiographies which focus on the narrator's triumph over trauma and abuse, and while the first writer to truly break this market was possibly Dave Pelzer in the mid-1990s, the popularity of the genre still persists unabated, as perhaps evidenced by the release of Jennifer Lauck's final volume of her memoir, Found, in 2011 - a story which kicked off with the first instalment, Blackbird, in the year 2000. It's easy to see why this type of literature has caught on. Inspiration and voyeurism combine to make an emotionally intense product, written in an accessible style that all can read easily, at least in terms of its literary level if not its gruelling content. Equally, it's escapism; we feel that this could never happen to us, and feel relieved that it has not. 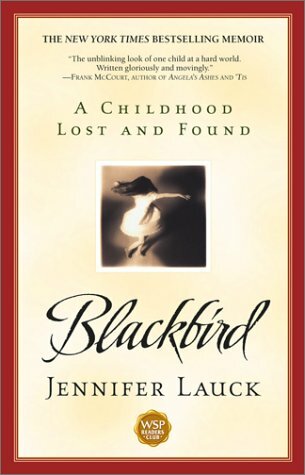 Blackbird also fits into this framework of description - once we start reading, we are easily swept up into the story of Jennifer's childhood and our horror at her role as carer. Although at times the sequence of events can seem unrealistic given that bad things seem to pile on top of bad things unrelentingly, this is sadly the case for some people's lives, and as readers of this type of autobiography, it is perhaps more our role to listen than to judge. In contrast to the events that take place, the characters seem on the whole to be very realistic indeed: Jennifer and her brother annoy each other as smaller children and then only later find affection for each other and things that they have in common, as is usual for siblings, and the development of this relationship made for a touching read. To the same degree, Jennifer's father comes across just as a nice guy trying (albeit failing in some respects) to do right by his kids. Perhaps understandably, the exceptions to this portrayal of characters and relationships come in the form of Jennifer's mother, who is accorded love and light in seemingly infinite amounts, and Jennifer's stepmother, who is portrayed as nothing less than a purveyor of evil. This inconsistency is arguably carried through into the way in which Lauck controls events: at some moments, such as when she finds herself in a situation where she is vulnerable to abuse, we have the feeling that unlike in some 'misery lit' memoirs, she retains her privacy and keeps some of the more gruesome details to herself. However, there are also moments where Blackbird feels rushed, and some important details are left out, leading to confusion in the plot (we do not know why she is sent away so suddenly, or why she is so suddenly separated from her family). What we therefore have is a noble attempt at a contribution to this genre, but something which needed further tidying up prior to publication (which is perhaps somewhat surprising given Lauck's prestigious journalistic background). The pioneer of high-quality literature in this category still, to me, remains Frank McCourt, rather than Dave Pelzer, Jennifer Lauck, or any other exponents of this type of writing that I have so far encountered. It would be my advice to seek out McCourt's writing instead.